We are starting on an Engineering Unit. This week’s theme was Towers. 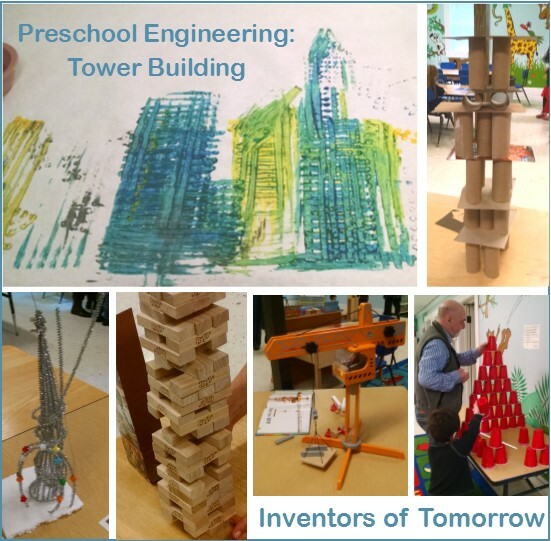 In class, we wanted to explore different materials for tower building, to tinker and figure out how to make a tower more stable, and to have lots of fun knocking down the towers that we built. 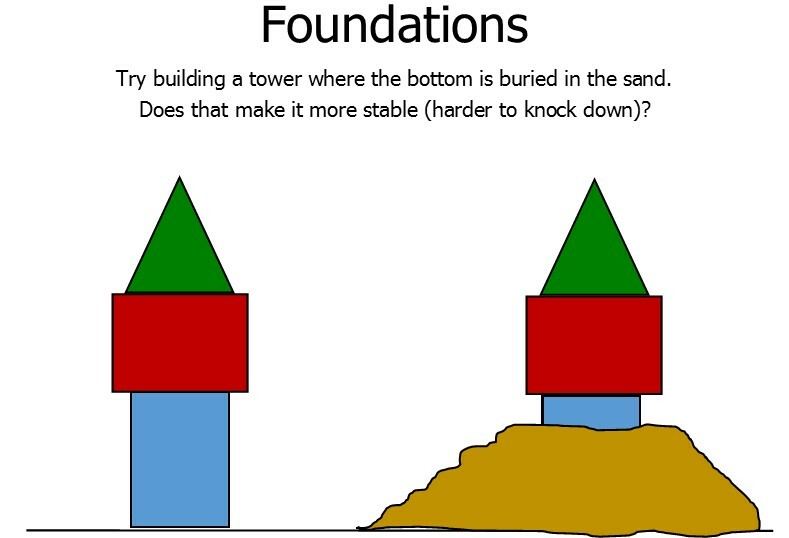 We also explored reasons why people build towers. 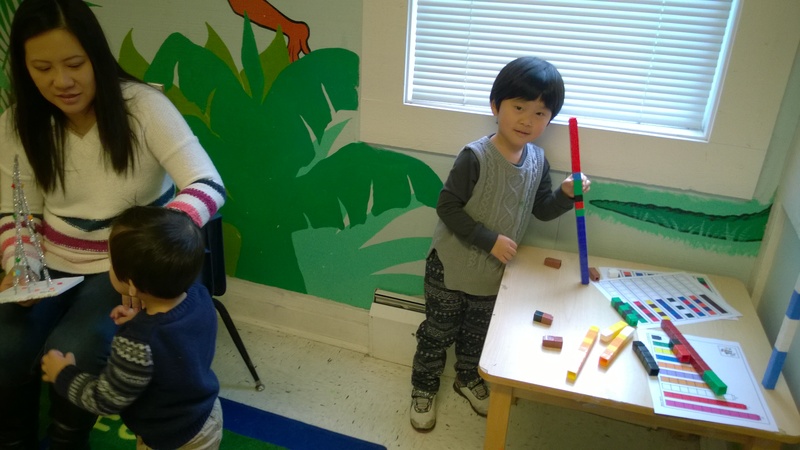 A simple tower is one of the first things that children can build – at 12 – 15 months, they may stack two blocks. By three years, almost every child can stack towers of ten blocks, but some children may stack many more than that, if they’ve done a lot of block play at home. And specialty blocks that interlock allow for taller towers. The other day, I worked with a 26 month old as he stacked up a tower of Duplos that was taller than he was. Probably 40 or more blocks. So, stacking blocks is easily doable for the youngest child in our Inventors’ class, but is also a challenge that grows with a child. Our 6 and 7 year olds were challenged by experiencing different materials and learning how to stack them to engineer the highest and sturdiest tower. They really explored the ways to make the towers more stable. (As we talked about in circle time.) We also see lots of parents and grandparents get engaged in the tower building challenge. Kids love it when the parents play along! 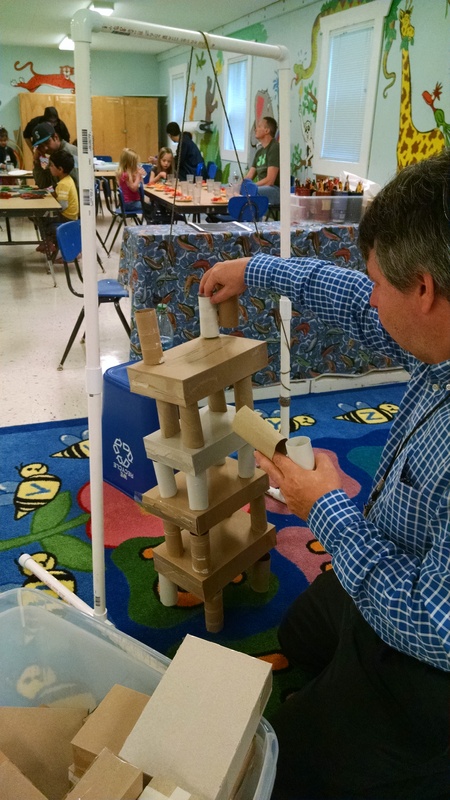 We offered a wide array of tower building materials, and also a number of methods for knocking them down. You’ll notice that knocking them down was an actively planned part of the curriculum. Why? Well, we know kids will do it anyway. May as well make it a fun and completely acceptable part of the day. We’d cheer for great towers and we’d also cheer for great moments of tower destruction. 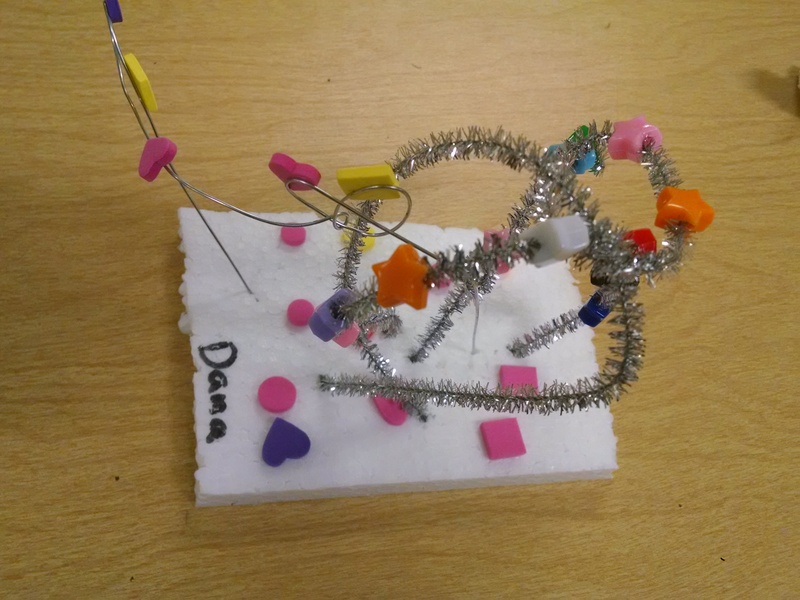 But also, a goal was to emphasize the tinkering mentality or engineering process: build something, test it, refine it, test it again, start over when needed. 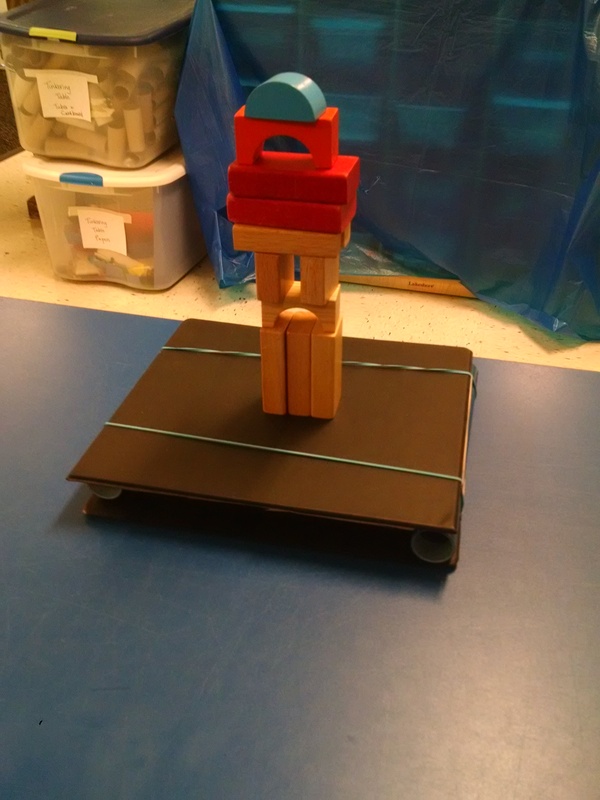 Some children re-built with the goal of making the structure as solid and stable as they possibly could – trying to make a structure that couldn’t be knocked down. Some went the opposite way, and build structures that would fall apart even more dramatically. Either goal was perfectly acceptable! You can stack simple towers (or domino style chains) with the extra planks that come with a set, then enjoy knocking them down. We made up a sign about wrecking ball rules (before knocking anything down you need to get the builder’s permission, before knocking them down, ask an adult to be sure it’s safe, and so on) in case we had issues and needed to enforce rules. But we ended up not needing it as kids were managing things well. If you’re working with a group, use your judgment about what rules need to be established before playing to keep it fun and safe. 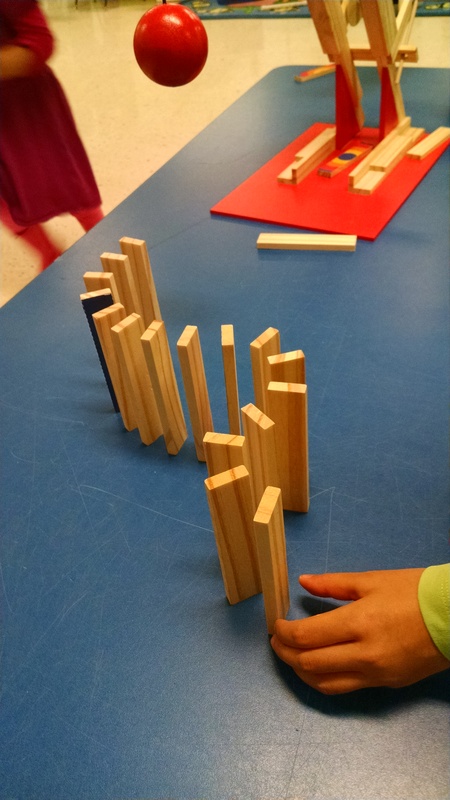 Jenga blocks and pendulum: Last year, we used Jenga blocks as a building tool. 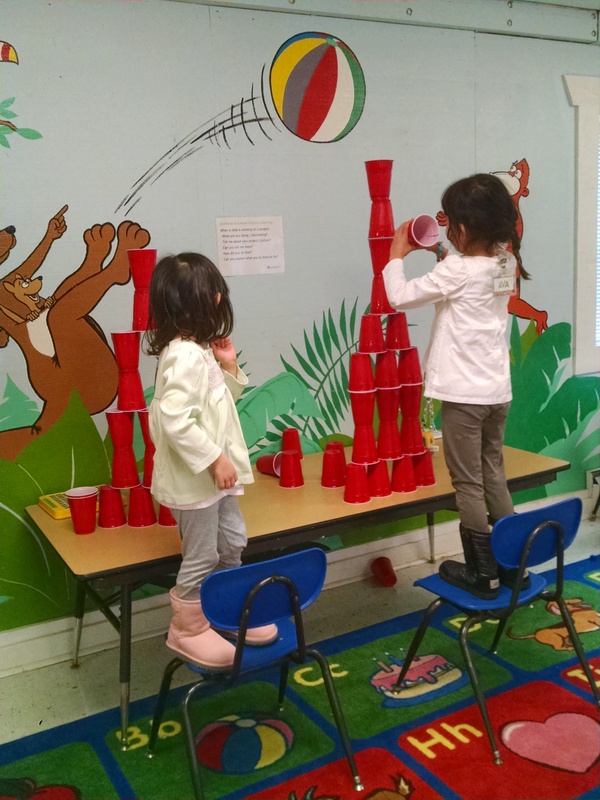 We built towers with Jenga, then knocked them down with a home-made pendulum – a tennis ball inside a cut-off leg from a pair of tights, that the kids could grab by one end and swing into their towers. I thought this would engage our big motor learners, but it didn’t as much as I’d hoped. It could be because its target and its effect was very similar to the wrecking ball and they liked the wrecking ball better. Jenga game: This year, we offered the Jenga game on a table, with some chairs set at it. 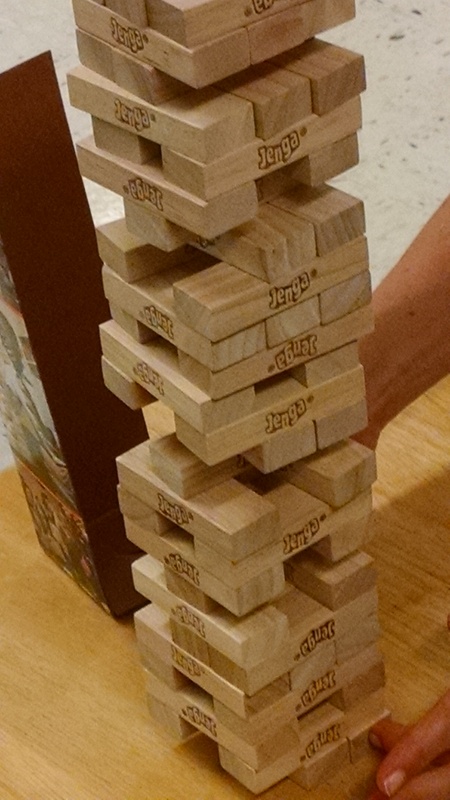 In each class session, we had a couple kids who really enjoyed playing Jenga with a parent – stacking a tall tower, and carefully sliding blocks out and stacking them on top, trying hard not to knock it down. 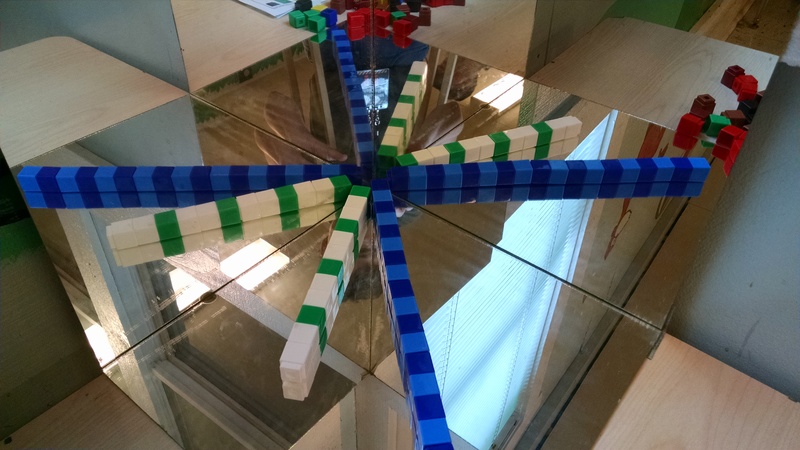 A new pendulum plan – cardboard box towers: This year, we took an idea from Irresistible Ideas of tying the pendulum to the rafters, and using it to knock down tall towers of cereal boxes. We didn’t have rafters, so we built a PVC frame. For our wrecking ball, we wanted something that was heavy enough it would knock down the boxes, but not so hard that it would hurt if it hit someone. (So, a baseball in a nylon was not a good idea, we thought. And we weren’t sure the tennis ball in a nylon would be heavy enough. We used a one-liter plastic bottle, filled 2/3 of the way with water.) 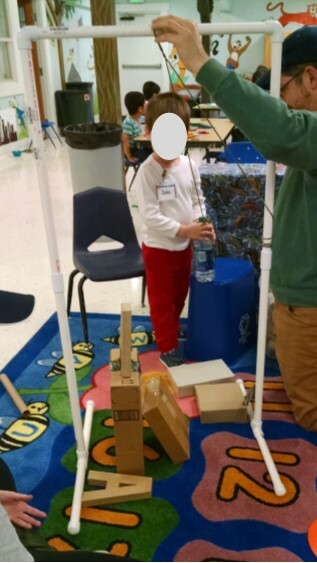 We’d set the water bottle on a platform (OK, a recycling bin turned upside down) while kids built a tower under the PVC frame, then they could pick up the water bottle, and let it swing. This was popular with a wide variety of ages. 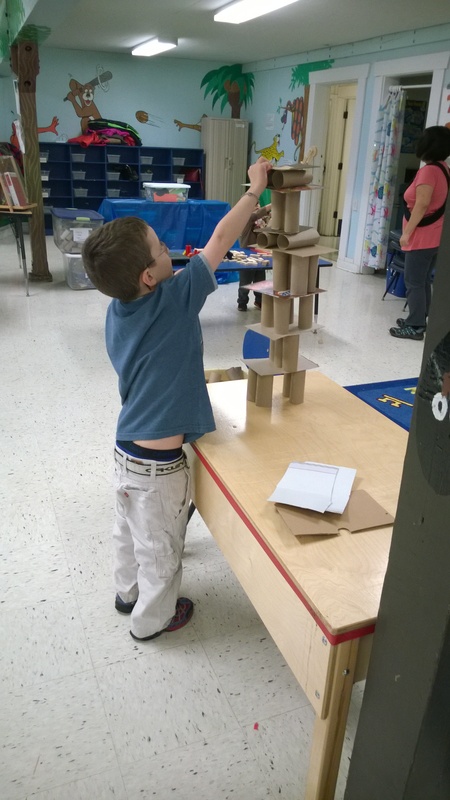 The older kids and adults liked building the towers. 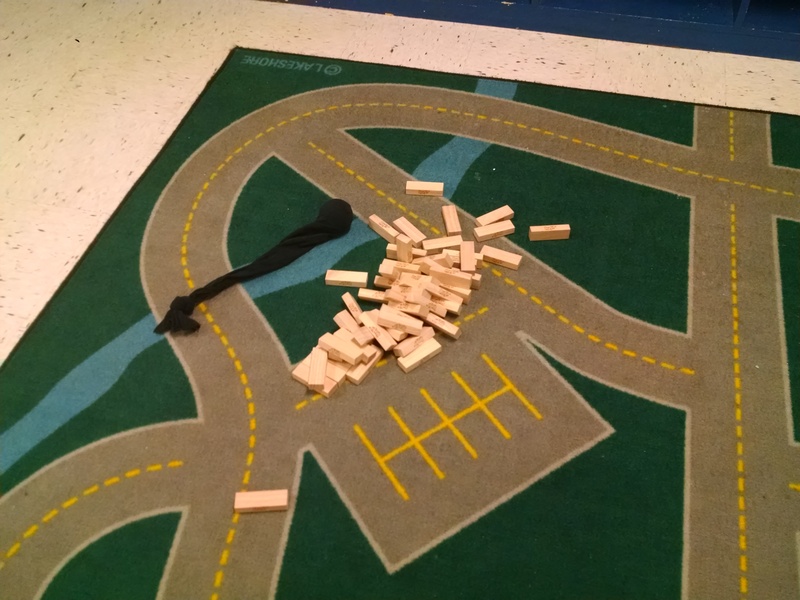 The younger kids liked knocking them down. Plastic cups. 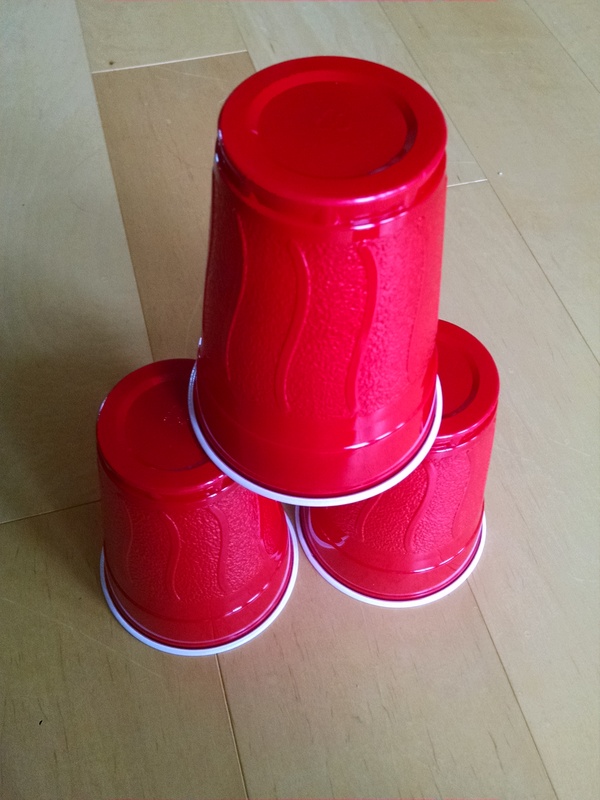 Probably our most popular activity of the day was building tall towers with red plastic cups, and then using a pull-back car to crash into them and knock them down. 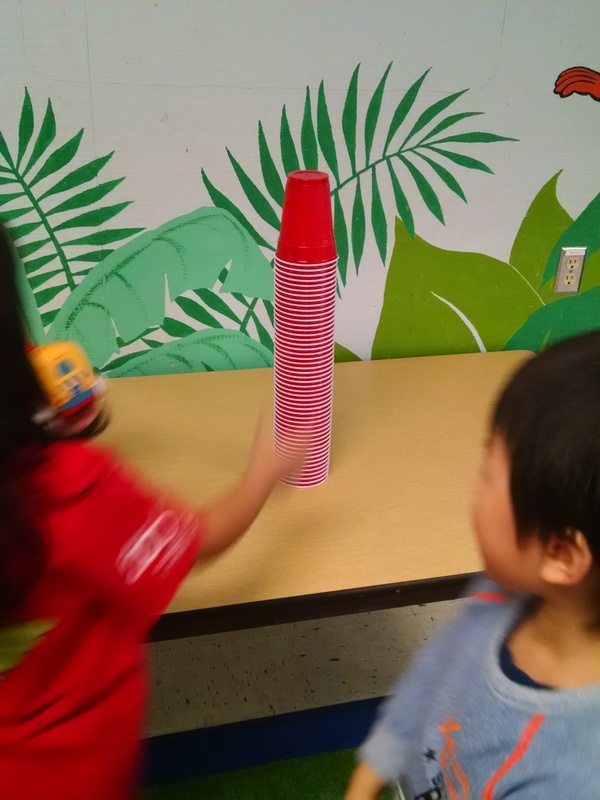 Advantages to this activity: it’s really cheap, the cups are almost infinitely re-useable (we only broke 2 out of 60 in four hours of play), children of all ages (and adults) can enjoy, and when the cups come crashing down on your head, they don’t hurt! This year, we just did the activity on the floor. This had the additional advantage that it is MUCH quieter when then cups crash down on a rug – the clattering crashes on the table and the floor last year were really loud. 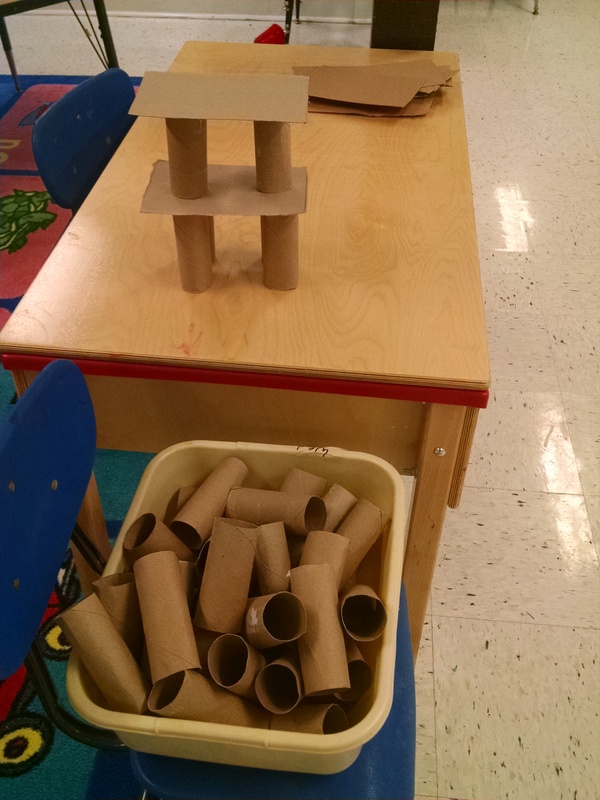 One of our older kids had built and crashed lots of towers. So we challenged her. 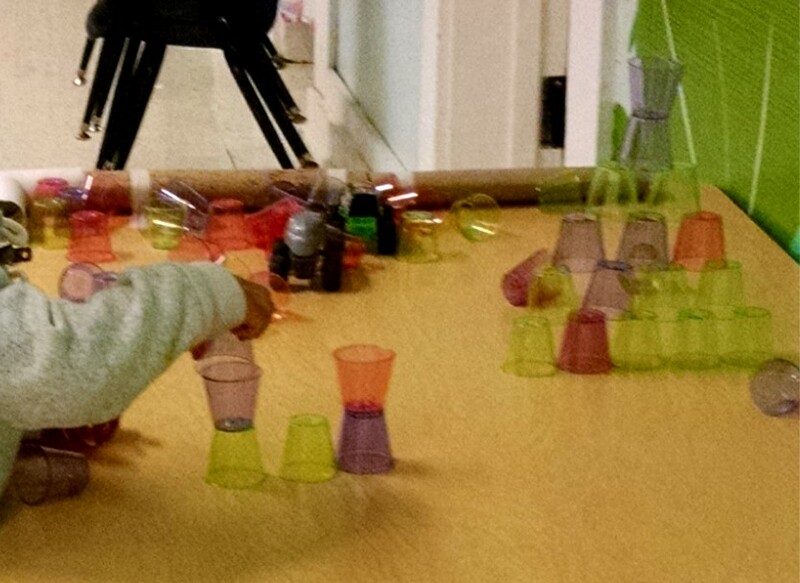 We said “Can you build a tower using ALL these cups that the car can’t knock down?” She did it, but in a lateral thinking way I didn’t expect! Mini plastic cups: I also found little plastic shot glasses at a dollar store, 24 for a buck. So we added those in this year, with a toy monster truck to knock them down. Wooden blocks and the shake table. 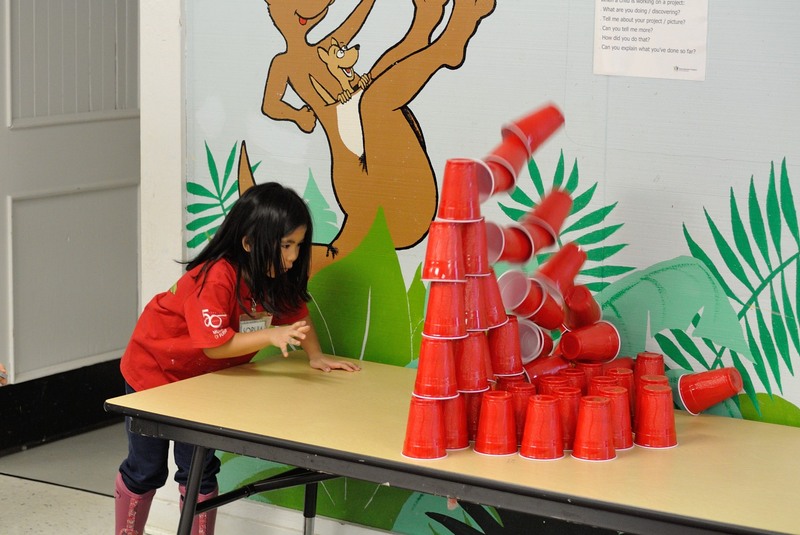 Last year, we brought back our quake simulator from Earthquake week, so kids could build towers and make them crumble. Foundations. 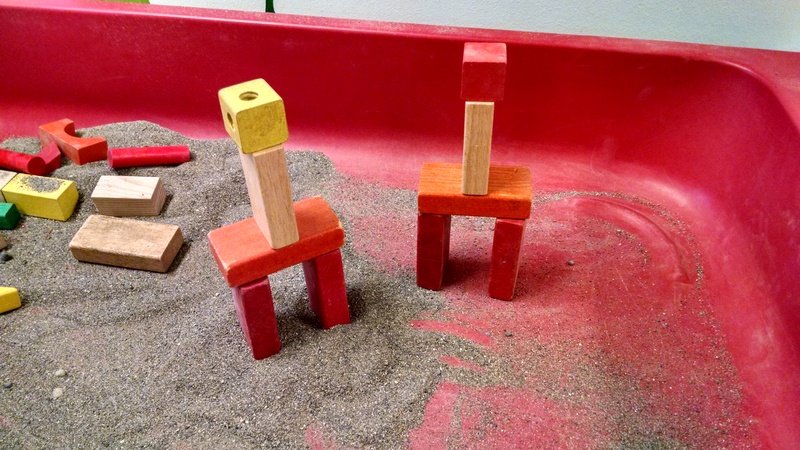 This year, we put sand and blocks in the sensory table, and encouraged kids to try building towers on the flat ground versus with the bottom block buried in the sand for stability. Magna-tiles. 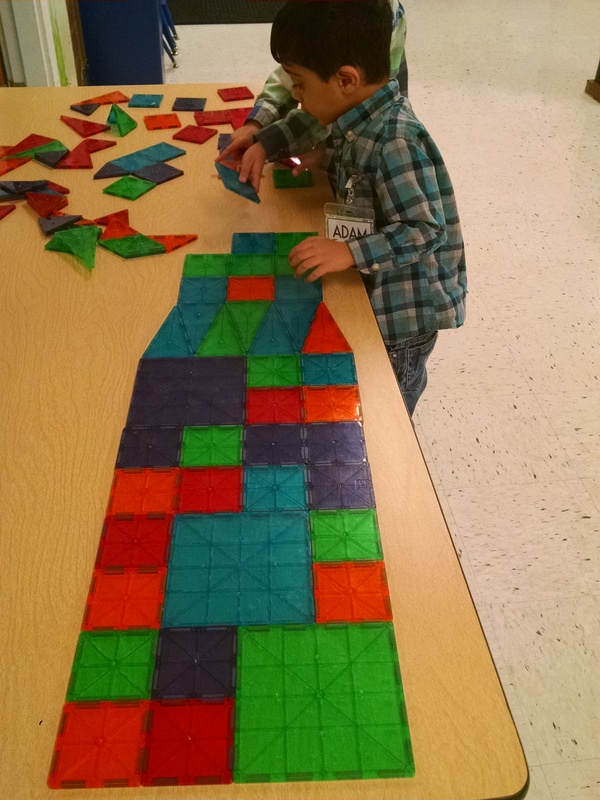 We have a building toy out almost every week, so they’ve seen the Magna-Tiles before, but this was another nice opportunity to play with them. 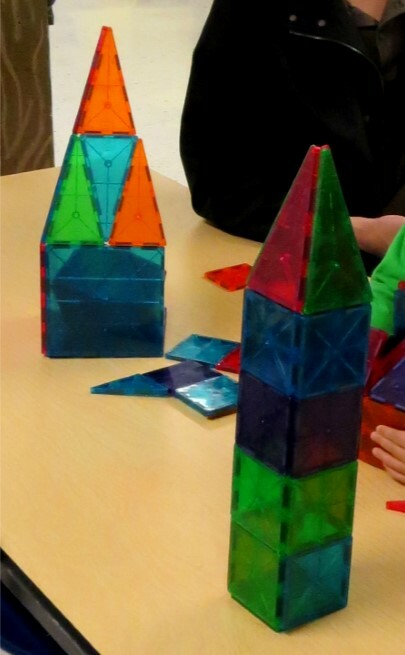 Some kids built houses or traditional 3-D towers. 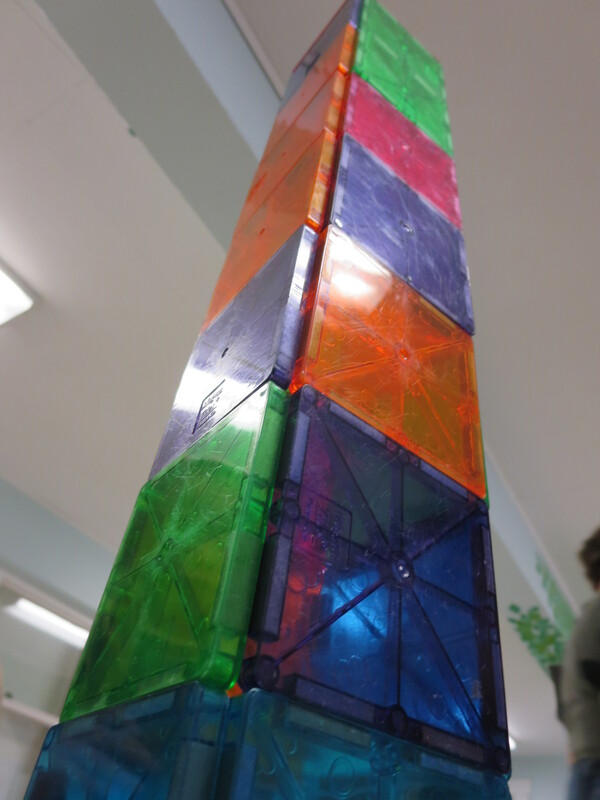 I also liked this two dimensional tower that one of our just-turned-three year olds built. Snack. 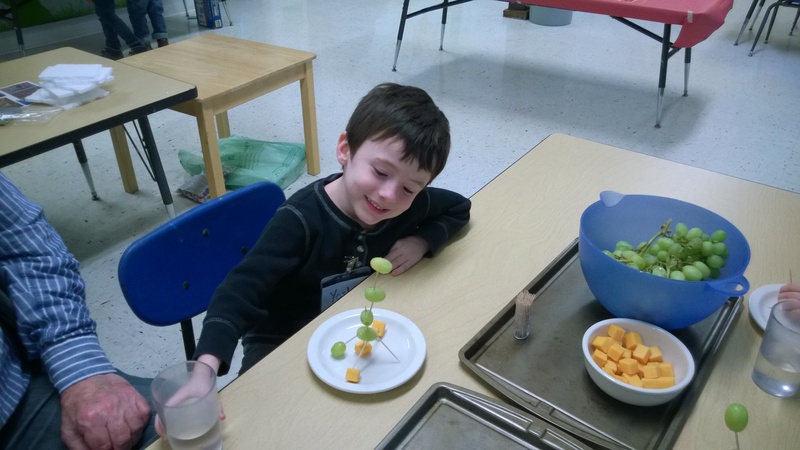 We used toothpicks, grapes, and cheese to build towers, and then dismantled them and ate them! In the morning class, I saw lots of building happening. In the afternoon class, there were also cupcakes available, and thus not much attention paid to building with healthy food! Tool of the Week: Our tool of the week was a building crane. 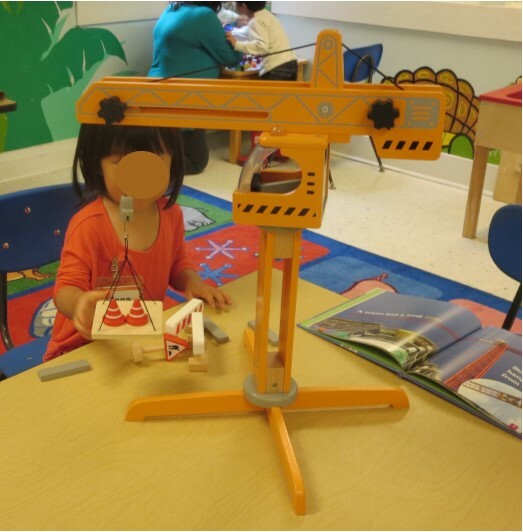 We were able to buy a “like new” Hape Crane on Amazon for just $25, which made it a fun addition to the class. 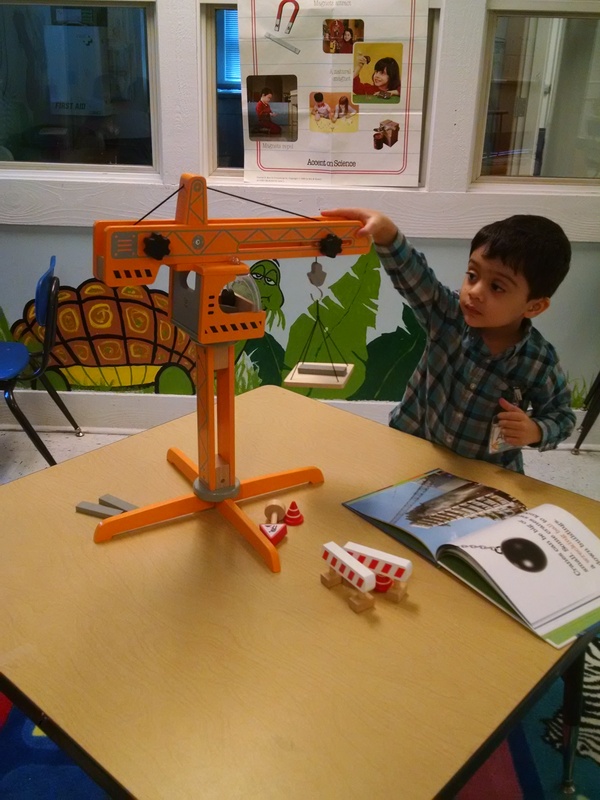 We put it out on a table with the book Cranes by Frisch, which is a nice preschool level introduction to the topic, much better for the purpose than Cranes by Becker, which goes into more detail than you need on all the different types of cranes. 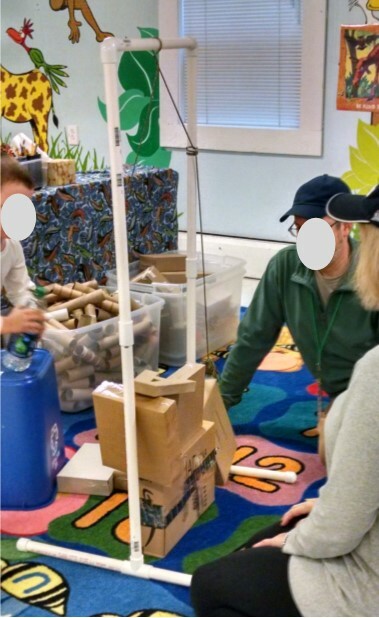 Kids could wind the crank up and down, bringing up a load… this activity would have been better if we’d placed the crane next to a tower of some sort, so kids could have better grasped the idea that you use a crane to raise material from the ground to the top of a building you’re working on. Watts Towers. In the Los Angeles area, from the 1920’s to the 1950’s a man named Simon Rodia gathered trash and found objects (rebar, concrete, broken bottles, tiles, pottery shards, and so on) and built an iconic piece of folk art, now a national historic landmark, known as the Watts Towers. (Learn more and see a video at www.wattstowers.us/simon_rodia.htm and in this Wikipedia article.) 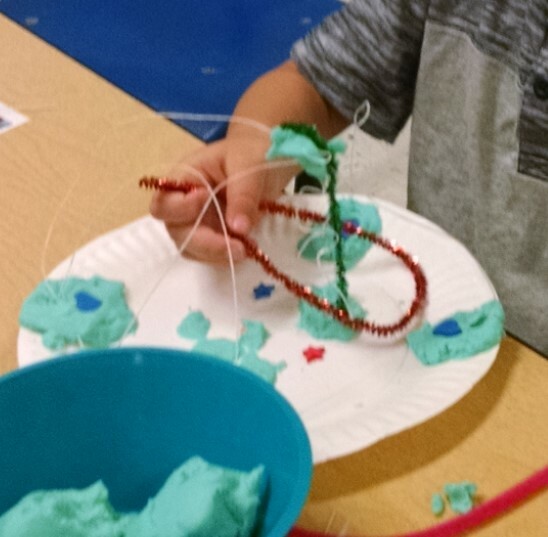 During circle time, we read the story (see below) and then we built our own towers using pipe cleaners and Floral Wire for the metal structure, plastic pony beads and adhesive foam shapes as the decorations. Last year, we used Styrofoam for the bases. 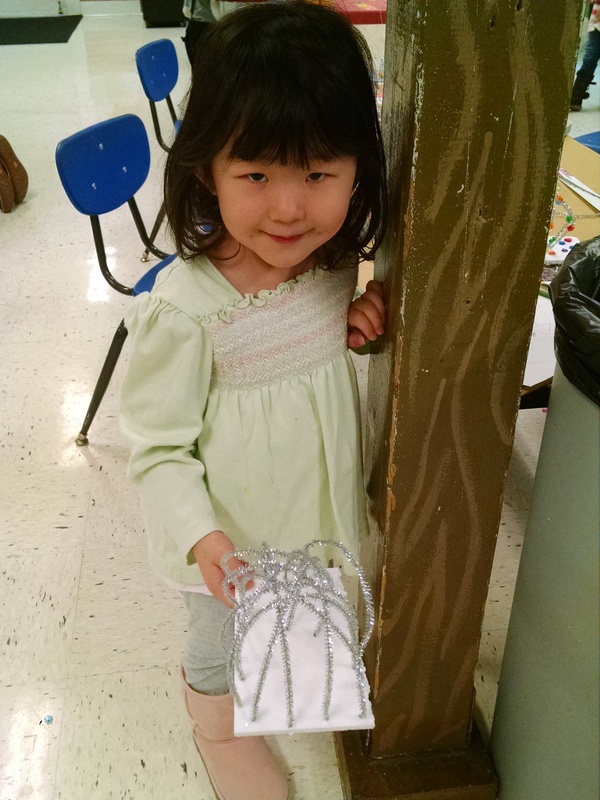 This year, we used paper plates, and playdough. Note: one book says the artist often listened to opera music while working, particularly the singer Enrico Caruso. 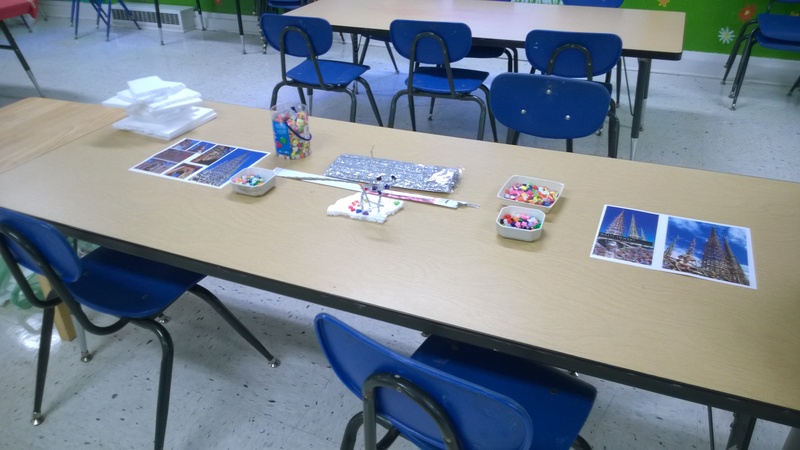 You could play opera music while kids worked on this project to enhance the experience. Cityscapes. I wanted to do something with the idea of skylines: bright squares of light on tall skyscrapers. Last year, I tried having them cut black buildings to put on a blue background and mini post-its for the windows. (Peeling mini post-its off the pad is good small motor practice for little ones. Buy your post-its at the dollar store – the office supply stores charge way too much.) It was an OK project, but not a hit. This year, I found a picture of Seattle’s skyline in silhouette. I printed it as a large mural and placed it on the wall for kids to decorate with mini post-its. No one did anything with it, but I think it was just a bad / invisible location. Another idea I’ve had, but haven’t tested. You could create an open grid with masking tape on black cardstock, paint it with white or yellow, then remove the tape… where there wasn’t tape would be the “windows” on the building. I haven’t used in my class, because my 5 and under kids just don’t have enough tape skills to pull out and lay down a long straight line of tape. Printing with Duplos. 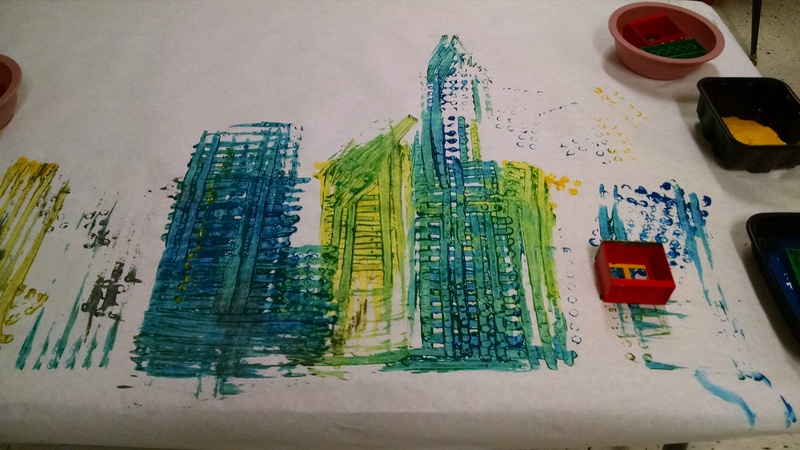 This was a process-based art activity, which we expected would be most popular with our youngest kids, but lots of the older ones also enjoyed it. I like using the table as a canvas with this sort of activity (as we did with the monster truck painting), because it allows a lot more freedom to spread out than small pieces of paper, plus it’s clear we’re doing a collaborative process, not creating individual products to take home. 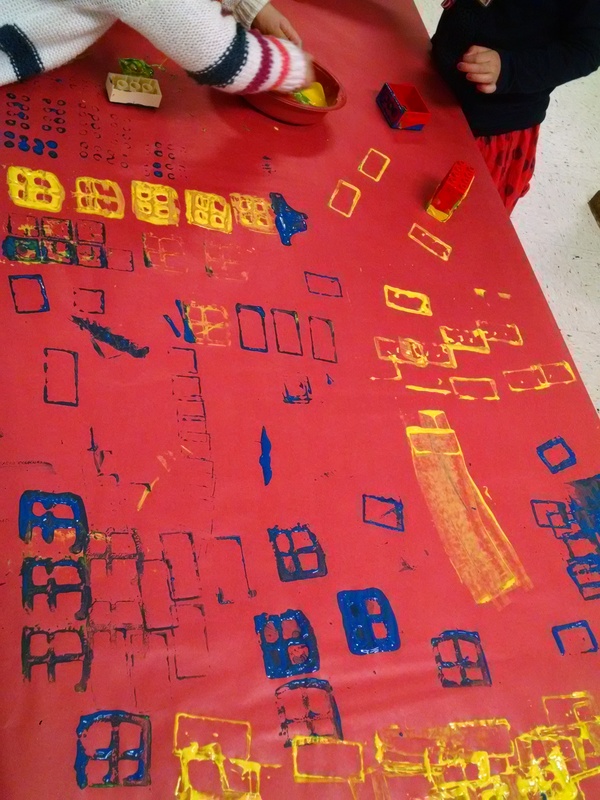 We put out some Unifix cubes that they could simply build towers out of, and added some “printables” we found online that gave examples of patterns they could build with the cubes. 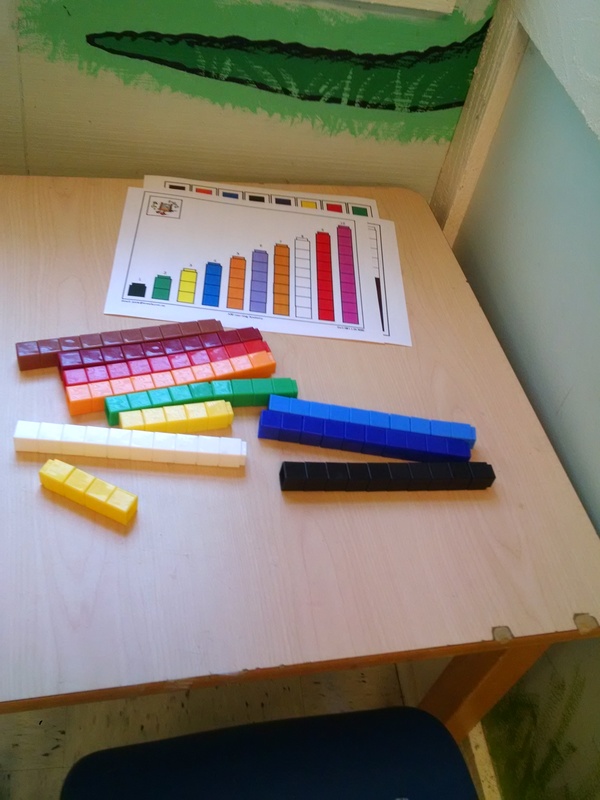 (To learn more about Unifix and building math skills, check out Measured Mom and this collection of counting activities.) This year, we placed these on a table with a mirrored box which created fun reflections. Observations and Discoveries. 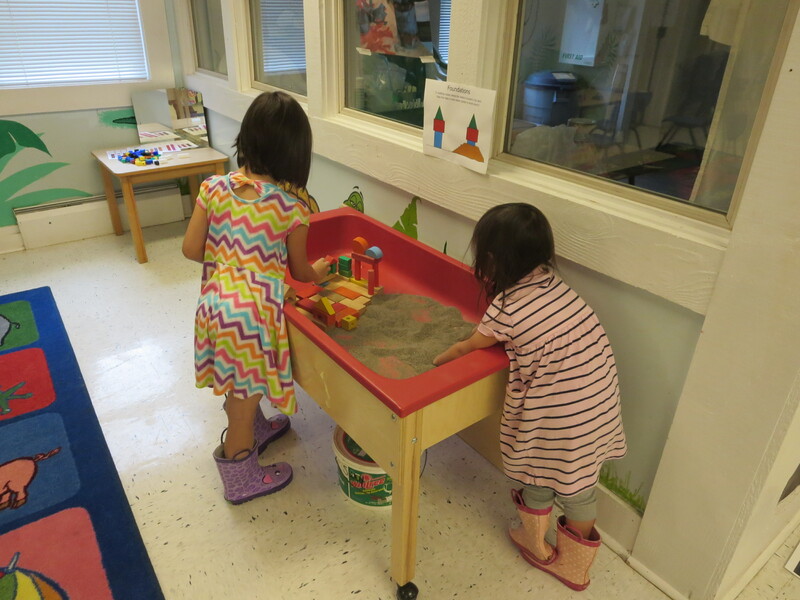 We started with a discussion of what they had played with during discovery time, and what they had learned. 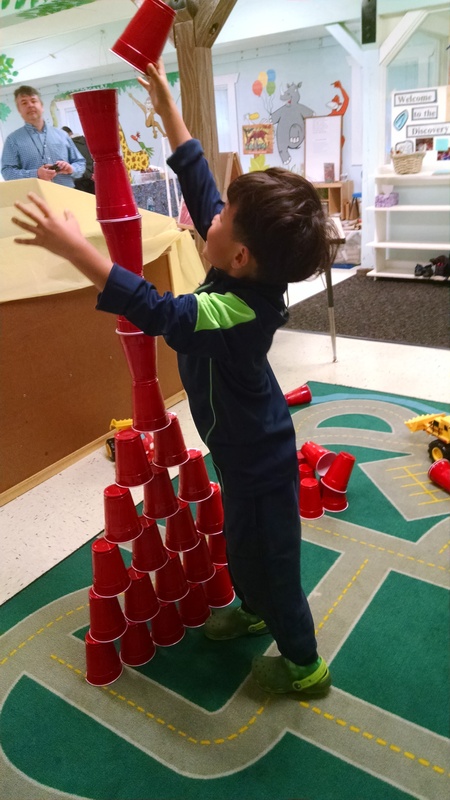 We asked them if building towers was challenging, and they said no, it was easy. 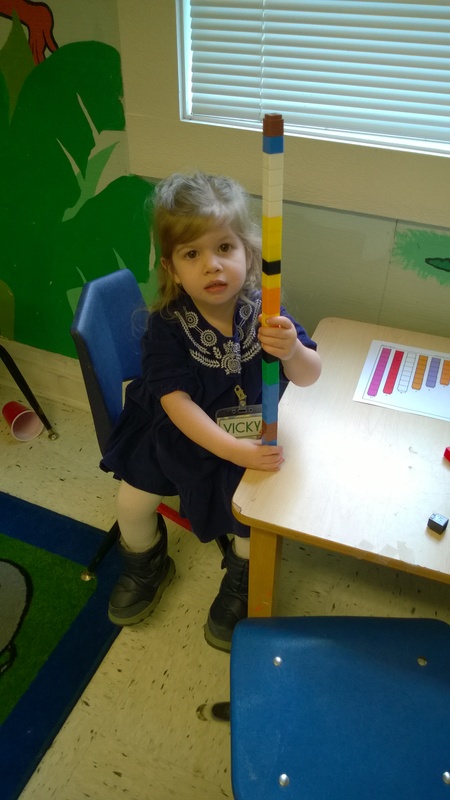 And we asked if building a REALLY tall tower that doesn’t fall down was challenging, and they agreed that it was. We asked them why it was challenging. No answer. So, we said “I want to build a tower this high. Can I start at the top? Can I put my top block here and then put the other blocks under it? No? Why not?” They figured out the answer was gravity. We then demonstrated with blocks how building a tower is a battle with gravity, and we talked about how we need to have strong materials, and balance them carefully so they support each other. 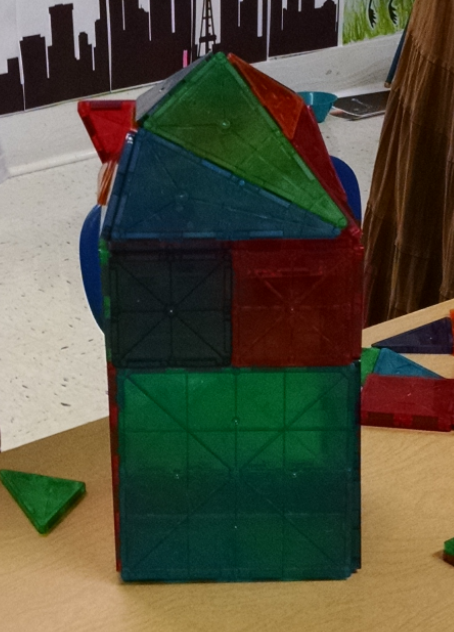 We then illustrated that in general, a wider base makes a more stable tower. We took a stack of ten square Duplos. Showed how easy it was to tip over. Then we showed a stack of ten Duplos in a pyramid shape (4 in a row on the bottom, then 3, then 2, then 1). Much harder to tip over if you press from the sides, but still easy if you push on the flat wall. 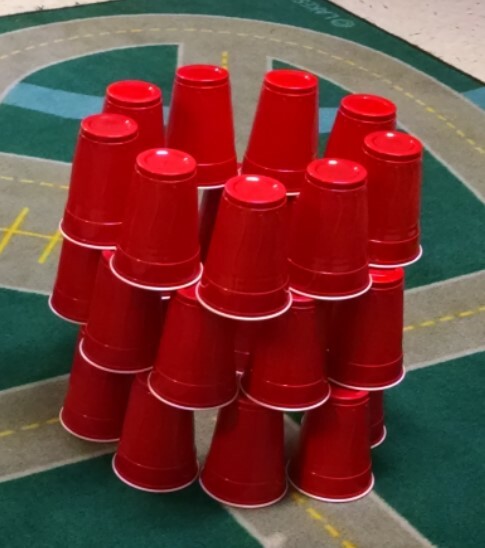 Then we showed ten Duplos in a 3 dimensional pyramid (a “rectangle” of 6 on the bottom, then a line of 3 blocks, then one on top) – much harder to knock over. Song. 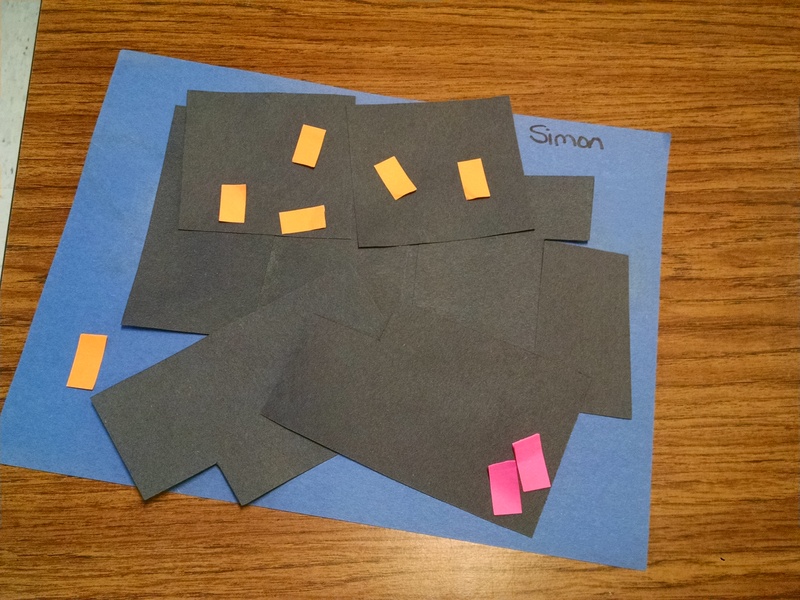 I found lyrics for a block building song online at Preschool Express. They say the lyrics were adapted from a poem by Peggy Sloan. There was no music. The first time I saw them, I made up a little tune I liked, but then I forgot what it was. The second time I looked at them, I realized I could make them fit the tune of the Final Jeopardy music. So, I played the tune for my class (which many kids and all parents recognized). Then I taught the words (which I had printed and posted) and we sang it through a few times. Careful now, don’t let it dro-o-o-o-op! Higher, higher – up you go. Take your time, just do it slow. 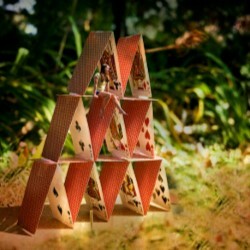 See how tall your stack can be-e-e.
Why do people build towers? I had found online, and printed, photos of: fire watch towers, lighthouses, castles with towers, water towers, grain silos, Manhattan, the Eiffel Tower and the Space Needle. 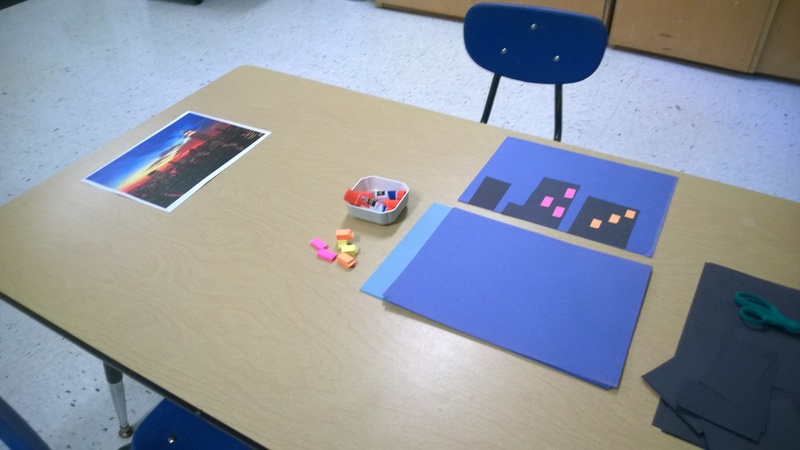 I asked the kids why people build towers, and I pointed out the pictures to give them some hints. We came up with these reasons: they let you see a long distance (good for fire watch and other lookouts), they can be seen from a long distance away (lighthouses help ships avoid rocky shores), they are easily defensible from attack, they use gravity to create water pressure, they’re a compact way to store a bulky thing like grains, they allow a lot of people to live in a small geographic area, and they’re pretty / distinctive and are good for landmarks. 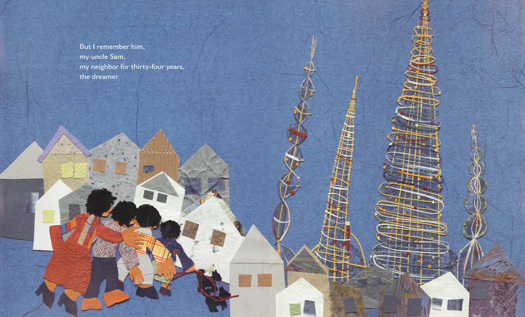 Book: We read Dream Something Big by Aston, which tells the story of the Watts Towers with beautiful collages by Roth. An alternative would be The Wonderful Towers of Watts by Zelver, illustrated by Lessac. I liked bringing this story in to class, because it brings in history (he started building almost a century ago), social sciences / culture (telling the story of an immigrant), art (the towers themselves AND the book’s illustrations of the towers), the idea of building beauty from other people’s junk, and dreaming big and creating something unique. 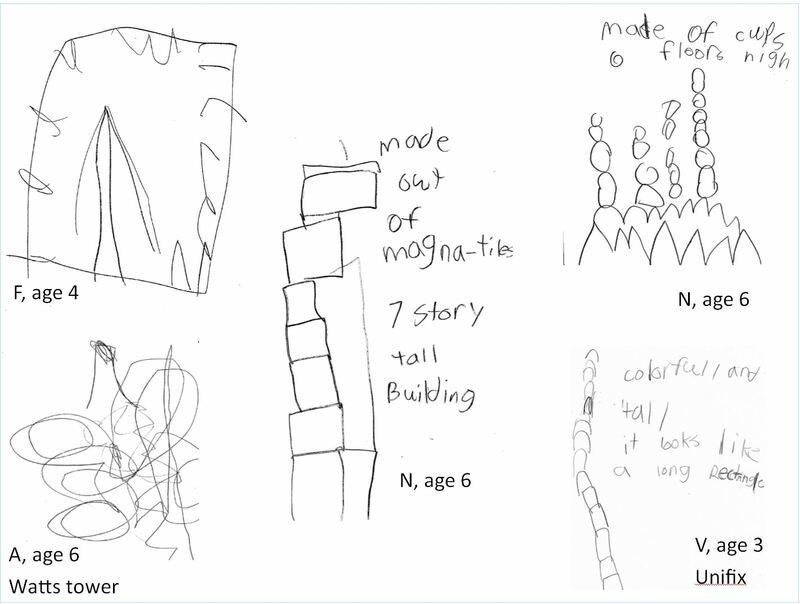 Only a few of the kids took us up on the idea of the journal, but we plan to bring it back more in future classes, because it helps the kids work on important skills: drawing from a model, writing, and describing their work. Also, keeping a record of a creation helps to imbue it with a little more sense of importance. Closing Circle. 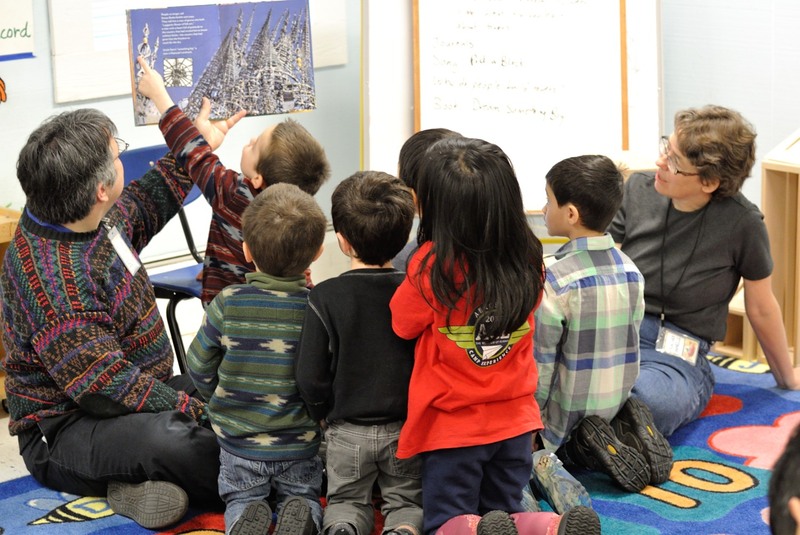 We ended with reading Block City which is a poem by Robert Louis Stevenson, written in 1883 about the joys of building with blocks and imagining faraway lands. The version our library had was illustrated by Wolff. Amazon stocks one illustrated by Kirk, and the description says it also includes follow-up activity ideas and a song. Zoe’s Tower by Rogers is a lovely book about a girl leaving home, going for a walk through the woods and the meadow to her special hideaway, then returning home. It is lovely, but really only tangentially about a tower, so we didn’t read it in class. How Tall Is Tall? : Comparing Structures is a fine non-fiction book for ages 6 – 8 about measurement, which includes examples like a house is 6 children tall, an electrical tower is 6 houses tall, Eiffel tower is one Golden Gate bridge plus one wind turbine tall. Not an interesting read-aloud. Changes, Changes by Hutchins is a wordless book which shows two dolls building a block house that ‘catches fire’, then re-building their blocks to be a fire engine to put out the fire, then re-building them to be a boat to sail away on all the water from the hose, etc. Nice for ages 3 – 5 as an illustration of imagination. Meeow and the Big Box by Braun. Good for three year olds. Simple words and simple illustrations about a cat painting a box, cutting a hole in it, adding some props and turning it into a fire engine. When I Build with Blocks. Who Swings the Wrecking Ball by Meinking was disappointing. It was really about its sub-title “working on a construction site” and only had the briefest mention of wrecking balls, when I was really wanting something focused on wrecking balls. Marshmallow Challenge: Just search for that phrase, and you’ll find LOTS of info on it. This is a team activity where the team is given 20 sticks of raw spaghetti, one yard of tape, one yard of string, and one marshmallow. (See a TED talk about it here and what it reveals about the nature of collaboration and why 6 year olds are better at it than adults.) 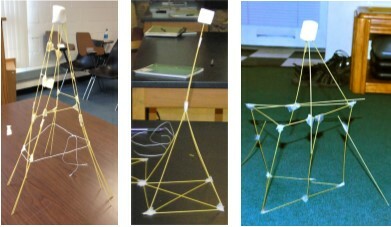 Their job is to build the tallest possible structure to support the marshmallow on the top, using only those materials. We didn’t use this, simply because our 3 – 4 year olds just don’t have the tape and string skills, or the manual dexterity not to break the noodles. Here are some sample towers from the web. Stone Towers. If you’re out on the beach and find flat stones, this is a great nature art activity! 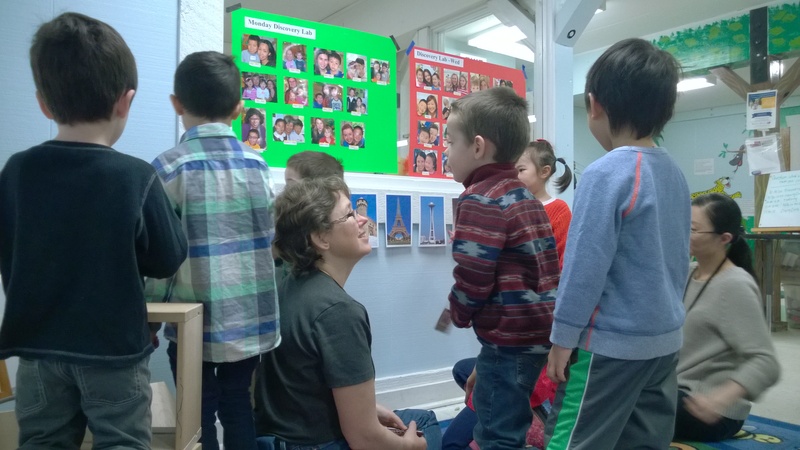 It can also be brought inside into the classroom, check out the Curious Kindergarten to learn more. 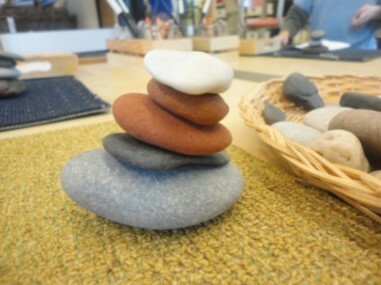 We didn’t have a chance to gather flat stones for this activity. Hopefully, in the future, we’ll add this, as I love bringing in natural materials. If you’re building stone towers, you could add in the book Bring Me a Rock! by Miyares. It is a story of an arrogant insect king who demands that other bugs bring him rocks. They build a tall tower that he reclines upon. But it’s unstable and starts to tip, and the littlest bug (who the king previously derided saves the day by adding a pebble shim to the bottom of the tower to stabilize it. 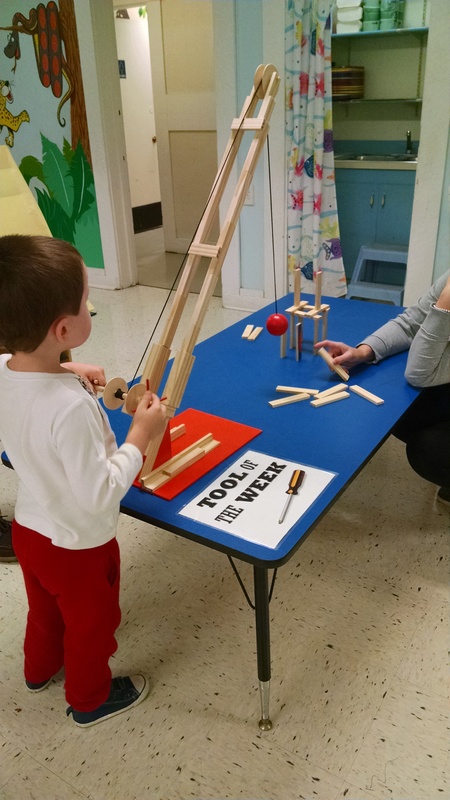 Cup Towers and Blow Darts: Kid’s Activity blog offers this great idea of loading a q-tip inside a straw for a blow dart gun. 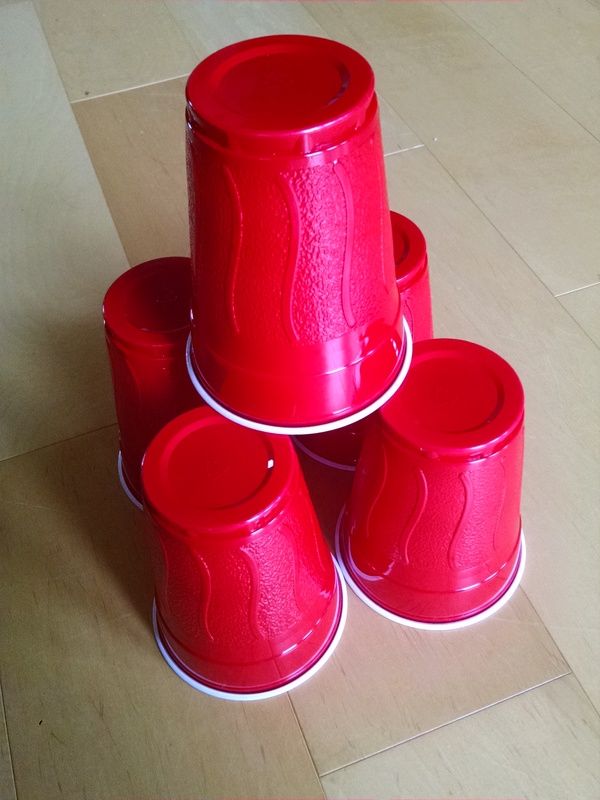 Then set up a pyramid of plastic cups. Then the kids blow through the straw to launch the q-tip and knock over the cups. Sounds like great fun. I just didn’t want to deal with germ sharing issues that come up when straws are involved.